The United States Mint , following the direction of the Presidential $1 Coin Act of 2005 (Public Law 109-145), has created a new design for the 2010 Abraham Lincoln Cent. This new coin comes on the heels of the highly successful series of four cents released in 2009 honoring different aspects of Lincoln's life. The Act states the obverse of the coin "shall bear an image emblematic of President Lincoln's preservation of the United States of America as a single and united country." As such, an image of a union shield has been selected to grace the coin. The shield was used many times on frescoes throughout the halls of the U.S. Capitol Building completed by Constantino Brumidi, the artist of the Capitol during Lincoln's presidency. It shows thirteen stripes for the original thirteen colonies which joined to form the federal government which is represented by the bar over the stripes. The obverse shows a portrait of Abraham Lincoln facing right. It was designed by Victor D. Brenner over 100 years ago. It includes the words "IN GOD WE TRUST", "LIBERTY", "2010", and if minted in Denver, the mintmark "D". The reverse was designed by Lyndall Bass and sculpted by Joseph Menna. It features a thirteen striped union shield typical of design during Lincoln's presidency. 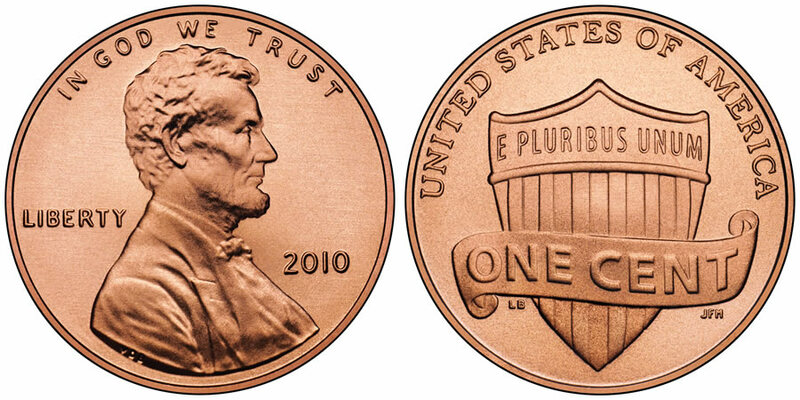 On the shield is the inscription "E PLURIBUS UNUM" with a scroll containing "ONE CENT" running over it. Above the shield is "UNITED STATES OF AMERICA."